It is a sum typically in the form of cash. This sum is paid by the tenant to the landlord before moving in to the rental property whether it’s a lease or a rental agreement. The amount of the security deposit is determined according to the monthly rent. That is, the total amount of one or more month’s rent is kept as a security deposit by the landlord. For instance, if the rent is $1000, and according to the lease agreement the tenant will pay three month’s rent in advance as security deposit before moving in, then the amount paid will be $3000. This would eventually have to be returned to the tenant when they leave the property. It is the right of landlord to ask for security deposit from the tenant before handing over the property so that if there is a breach of lease or damage caused to the property – or the tenant refuses to pay the rent – then the amount will be deducted from the security deposit. What are the benefits of collecting a security deposit? Cautious Tenants: When tenants have blocked a reasonable sum of money as security deposit in the hands of landlord, they would most certainly remain careful. No one likes to lose money and this is why tenants would want to follow the lease terms. Protection of Rental Unit: By collecting a security deposit, a landlord can feel at peace because tenant will make sure the rented property is well-maintained and no damage is caused otherwise the cost of repair will be deducted from the deposited sum. No Need to File a Lawsuit: Since landlord has a reasonable amount as a security deposit, in case of minor damages it will be possible to make immediate deductions without having to file a case and go through the lengthy prosecution process in a California Court. Safeguarding Rent Reception: Security deposit amount is usually equivalent of at least one month’s rent therefore, it will also help landlords in getting the rent if tenant stops paying it. How Much Can Landlords Charge as Security Deposit in California? Remember that every state has different laws and rules for security deposits. In the United States, there is no uniform rule and landlords/tenants have to confirm the applicable laws of the state regarding rent and security deposit. Under California landlord-tenant laws, a landlord can charge a renter the equivalent of two months’ rent for the security deposit if the residence is unfurnished. That goes up to three months’ rent in California if the residence is furnished. The maximum sum or limit that can be charged as a security deposit will be determined according to state’s law. For example, under California law landlords can also add an extra one-half month’s rent if the tenant has a waterbed. Also, there are specific rules regarding how long after tenant’s moving out the landlord needs to return the security deposit as well as the reasons when landlord can make deductions from the deposit. If you want to avoid problems, we suggest that you include the terms of the security deposit in the Lease or Rental Agreement if you have or intend to collect it from your tenant. The agreement much include information about the amount of the security deposit, reasons for making deductions from it, where the amount will be stored and how/when the deposit will be returned to the tenant. In a majority of states including California Tenant-Landlord Law, it is compulsory for the landlord to provide the security deposit collection receipt to the tenant, which will include information about the total amount, name and address of the financial institution where the deposit is stored and the annual interest rate. Every state in the US has made it legal for the landlord to make some deductions from the security deposit. When the rental agreement is over or the lease agreement expires, the landlord will review whether the tenant has followed all the terms of the lease and if it is so, this rules that the security deposit will be returned to the tenant. However, if any of the lease’s terms or rules of the rental agreement have been breached such as non-payment of rent or damages to the rental unit, the landlord can keep a portion or the whole security deposit to cover the costs, depending upon the loss and expenses involved for covering it. Landlord must provide the legal reason for keeping some or whole of the deposit because this is the tenant’s first defense against the deduction that it is unfair. 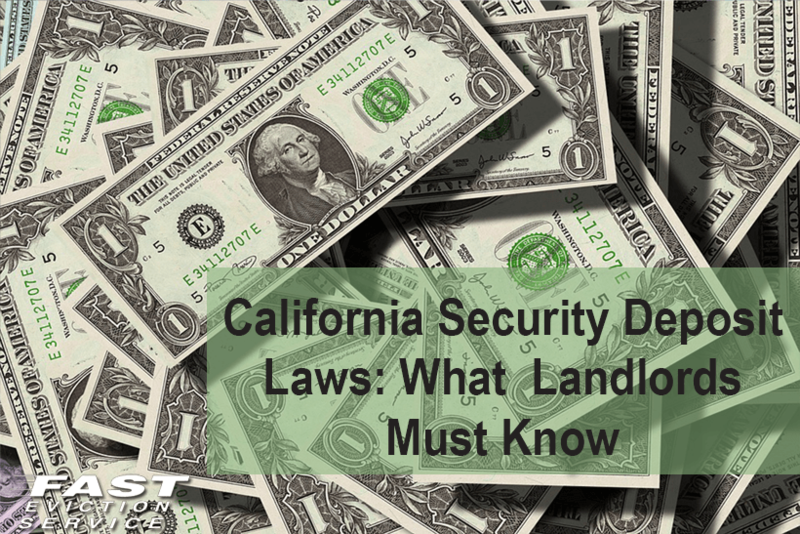 California’s landlord tenant laws will determine the legal reasons for deducting cash from a security deposit. The most common reasons include property damage, violation of lease terms and early eviction. If none of the reasons defined by the law has occurred then a California landlord cannot take deductions from the security deposit. Landlords must also prove that their actions are in complete accordance with the laws of the state, county and city. It is important to have a legal reason to withhold the security deposit and follow the deduction process correctly. In case the tenant isn’t satisfied with the legality of a security deposit deduction then he/she would want to look for violations of California law on landlord’s part, which can be avoided if laws are understood beforehand. Always provide evidence to back up your claim; such as if you have deducted an amount from the security deposit claiming that tenant has damaged the property then prove it with before and after photographs or video evidence. In case the dispute persists despite proving the legitimacy of the deduction to the tenant, then the tenant may sue the landlord in small claims court for recovering the deducted amount. Landlord will have to decide whether he wants to deal with the lawsuit or settle the dispute out of court. If the damage isn’t so bad or the amount owed is low while the court proceeding is time consuming then it won’t be a good idea to go through so much hassle. However, if the landlord is sure that the deducted is fair and according to the law then it is a good idea to settle the dispute in court. Disputes over security deposits are one of the most common and expensive landlord tenant conflicts. If you are a landlord, it’s essential to understand what you must know about California security deposit laws to avoid disputes, court costs – and frustration!